This fabulous home, located on an idyllic rural Victorian farm site steeped in history, is filled with unusual features that make it truly stand out. Home Farm, as it is now known, was sensitively and carefully converted into a community of 13 fantastic homes with The Old Dairy certainly being the cream of the crop. As you approach the house down its neat gravel shared drive, you reach the property at the cul de sac end. You are immediately struck by its unique beauty with its Victorian iron lattice windows, canopied porch and pitched tiled roof topped with a weather vane adding period elegance. Entering the bright entrance hallway, first on your left is the dining room flooded with light from its pretty dual aspect widows. Conveniently placed opposite is the fabulous octagonal shaped kitchen with its striking domed ceiling with exposed beams. A listed marble milk cooler has been cleverly adopted as a table centrepiece whilst the well fitted country cabinets wrap around the room leaving you plenty of space to sit and take in the view. Returning to the entrance with a window bringing in glorious garden views a couple of steps take you down to the sitting room on your right. A part glazed stable door adds country charm while its exposed brick fireplace with wood burning stove has a warming hearth your family will love to gather round. Built in bookshelves flank the fireplace making wonderful areas for storage or display. At the end of the hallway past a useful guest cloakroom and under stairs storage cupboard, there are two ground floor bedrooms one of which is currently set up as a home office. Climbing the stairs to the first floor with a deep walk in wardrobe on the landing, there are two double bedrooms and not one but two generously sized contemporary family bathrooms, one of which is en-suite. Both first floor bedrooms have fantastic open countryside views with the master bedroom`s circular window adding a touch of ‘a room with a view` romance. Outside a pretty cottage garden lies predominantly to the rear of the house and is laid mainly to lawn with mature trees, shrubs and hedging providing a high degree of privacy and safely self-contained for pets and children. A paved terrace wraps around the rear of the house giving plenty of space for alfreso dining while you enjoy the far-reaching farmland views. This beautiful unique home is brimming with character from its period features and striking unspoilt country views. It is also well placed for commuters being only a mile from the local mainline stations with excellent rail links to central London. 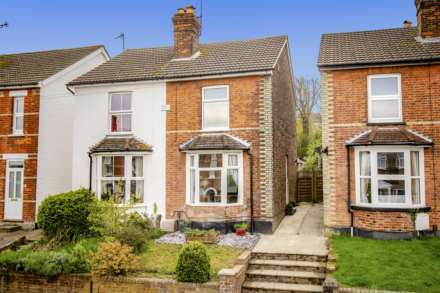 To top it off this happy family home is immaculate so is perfect to move straight in. A must see! Dining Room: 12`9 x 9`10` front aspect lattice window, side aspect double glazed window and radiator. The room is spacious and light, perfect for dining and entertaining in. Kitchen/Breakfast Room: 17`9 x 17`9` front, side and rear aspect lattice windows with secondary glazing, domed beamed ceiling, listed marble milk cooler, one and half bowl sink with drainer and mixer tap over, tiled flooring, space and plumbing for a dishwasher, space for dishwasher, space for large fridge/freezer, Bosch electric double oven with 4 ring gas hob and extractor fan above and radiators. The kitchen has plenty of granite worktop space and a good selection of eye and base level shaker style cream units, some glazed, with a fitted wine rack. Sitting Room: 15`11 x 14`7` rear aspect double glazed window overlooking the garden, part glazed stable door giving garden access with glazed inner door and radiator. A large brick fireplace with a tiled hearth and wood burning stove adds character and warmth to this relaxing space with alcove shelving with cupboards under either side. Cloakroom: front and side aspect opaque double glazed windows, pedestal wash hand basin with mixer tap over, low level WC, tiled flooring and radiator. Bedroom: 10`3 x 8`10` rear aspect double glazed window and radiator. Bedroom (currently set up as a home office): 8`4 x 7`3` front aspect double glazed window and radiator. Master Bedroom: 14`6 x 9`4` circular side aspect double glazed window with views of the garden, loft access hatch, exposed ceiling beams, wall eaves storage cupboard, fitted wardrobe with hanging rails and radiator. The master bedroom`s spacious en-suite with rear aspect double glazed window, panel enclosed bath with wall mounted Mira shower and glass shower screen, pedestal wash hand basin, part tiled walls, tiled flooring, low level WC, heated towel rail and radiator. Family Bathroom: rear aspect double glazed window, panel enclosed bath with wall mounted Mira shower and glass shower screen, pedestal wash hand basin, low level WC, tiled flooring and radiator. Bedroom: 14`6 x 9`4` rear aspect double glazed window overlooking the garden and fields beyond, fitted cupboard with hanging rails and shelving and radiator. Outside: The house is approached via a shared gravel driveway past visitors parking spaces leading to a private area with parking for two cars in front of a single attached garage with a side recessed storage area with shelving, electricity and lighting. A further reserved parking space sits just through the archway diagonally opposite the house. The beautiful rear garden is accessed through a side wooden gate and is laid mainly to lawn with a stone terrace wrapping around the back of the house. It is perfect for alfresco dining in the sun. Mature trees, hedging and shrubs border the perimeter of the garden making it a private and peaceful space whilst pretty flower beds and climbing plants add interest and colour. Stunning open countryside views lie behind the glorious garden while a small shed and the attached garage with electricity, lighting and an up and over door, provides adequate storage. 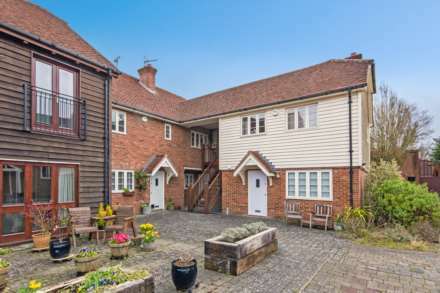 Leigh is an idyllic rural village that lies 3 miles west of Tonbridge and 6 miles south of Sevenoaks. It benefits from a large village green, a highly regarded Primary School, Church, Village store, post office, pub and railway station. The village enjoys a pretty tranquil setting amongst open countryside and delivers nature in abundance to be enjoyed either cycling, walking or spotting wildlife. For recreational activities, the property itself sits close to the fairways of the Hilden Golf and Leisure Club and the Tonbridge School gym, with its impressive facilities and indoor swimming pool, are a short drive away. There is also the Angel Sports Centre and the public swimming pool both based in the centre of Tonbridge. Apart from its own Primary School there are other highly regarded primary schools in the area such as Hildenborough Church of England and St Margaret Clitherow Catholic. There are also independent prep schools in Hildenborough: Fosse Bank; in Tonbridge: The Schools at Somerhill, Hilden Oaks and Hilden Grange and in Sevenoaks: Sevenoaks Preparatory School and the New Beacon. The highly sought after secondary level Tonbridge Girls Grammar School, Weald of Kent Girls Grammar and Judd Grammar for boys are in Tonbridge whilst the renowned Tonbridge and Sevenoaks Schools are within easy reach as are Sackville and Walthanstow Hall. Leigh Station is on the Victoria/Redhill line whilst Hildenborough Station is on the South Eastern Main Line and has fast and frequent services into London Charing Cross in 44 minutes. A commuter bus passes the end of the property`s main drive and can be taken to Hildenborough Station just a mile away both morning and evening. The nearby A21 links with the M25, other motorway networks, Gatwick and Heathrow Airports, and the Channel Tunnel Terminus.